our regional aspirations,��� explains Bryan Evans, the bank���s Head of Global Change Management and Production Acceptance. ���We were having to reboot the service management system three times a day, and it knocked people off because we didn���t have enough capability in the filters to service 2,000 users at a time.��� These and other issues recently led Anne Weatherston, ANZ���s CIO, to launch a new strategy of her own. Weatherston, who joined the bank in 2010, has committed herself to transforming IT at ANZ Bank into a services organization that fully supports the company���s nearly 47,000 employees worldwide. She also wants the bank to create a single global standard for service management that provides incident, change, request, problem and event management. Other goals include centralized configuration management and the ability to define, visualize and report on the impact to services. Says Evans: ���It���s the creation of a more mature event-alert and monitoring capability. If we���re to be seriously global, then we need serious global tools and processes.��� Gaining a global presence also means ANZ will need to boost the public���s trust of the banking industry, says McGrath. He particularly remembers one eye-opening trip, when McGrath and other IT staff were in an ANZ Bank branch reviewing an Internet kiosk, and a customer walked up to them. ���He said he loved banking with ANZ, and that he was going to bank with ANZ until the day he died,��� McGrath recounts. ���For me, it was a road-to-Damascus-type moment. It really struck home to me how important trust was in banking, and to this individual.��� Service Decisions The task of figuring out how to create an IT service management business in a banking context that is both loved and trusted by customers fell to McGrath. After joining ANZ Bank in January 2011, McGrath spent his first three months in the field learning about the business units that IT supports. ���What was clear from my perspective is that we really, really had to invest in the people and the leadership, and then in our framework,��� he says now. ���Anyone can deploy technology. But it���s the people who deploy it ��� and the people who support it ��� that really make a difference.��� The bank needed something to essentially connect the dots between the people, processes and IT resources that supported ANZ Bank at a Glance n H eadquarters: Melbourne, Australia n B RANDS: ANZ, OnePath, UDC Finance, EFTPOS New Zealand, Bonus Bonds, Direct Broking n B usiness operations worldwide: 32 countries n 2 012 revenue: AU$5.661 billion n E mployees worldwide: 47,000 n B ranches worldwide: 1,200 n A TMs worldwide: 4,000 n Transaction volume worldwide: 55 million a day DATA: ANZ Bank its business aspirations. ���Our prime aim of applying all of these tools and capabilities has been [about] avoiding incidents in the first place,��� Evans explains. ���But there will always be unfortunate times when we have an outage of some sort or an incident of some sort. So the question becomes: When an incident does occur, how quickly can we respond?��� ANZ Bank turned to CA Technologies for its CA Service Desk and CA Service Operations Insight, and to tools and best practices based on industry standards, including COBIT and ITIL��. But first the bank had to capture events from nearly 30 global platforms, loading some 100,000 technology items into a configuration management database (CMDB) and synchronizing contact records for as many as 47,000 employees. This kind of overhaul is crucial to banks as they constantly try to lower their efficiency ratio ��� the amount of money they need to spend to drive a dollar in revenue. 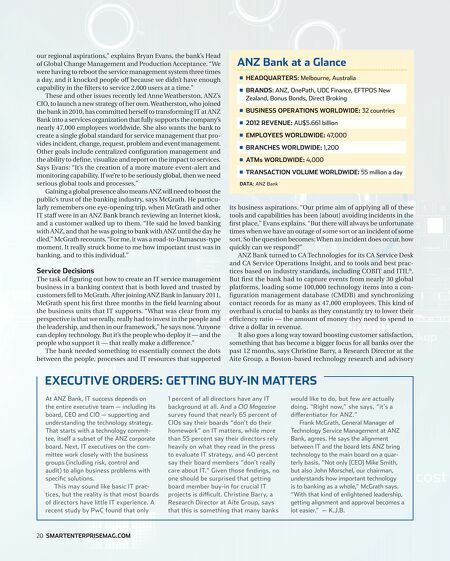 It also goes a long way toward boosting customer satisfaction, something that has become a bigger focus for all banks over the past 12 months, says Christine Barry, a Research Director at the Aite Group, a Boston-based technology research and advisory Executive Orders: Getting Buy-In Matters At ANZ Bank, IT success depends on the entire executive team ��� including its board, CEO and CIO ��� supporting and understanding the technology strategy. That starts with a technology committee, itself a subset of the ANZ corporate board. Next, IT executives on the committee work closely with the business groups (including risk, control and audit) to align business problems with specific solutions. This may sound like basic IT practices, but the reality is that most boards of directors have little IT experience. A recent study by PricewaterhouseCoopers 20 smartenterprisemag.com found that only 1 percent of all directors have any IT background at all. And a CIO Magazine survey found that nearly 65 percent of CIOs say their boards ���don���t do their homework��� on IT matters, while more than 55 percent say their directors rely heavily on what they read in the press to evaluate IT strategy, and 40 percent say their board members ���don���t really care about IT.��� Given those findings, no one should be surprised that getting board member buy-in for crucial IT projects is difficult. Christine Barry, a Research Director at Aite Group, says that this is something that many banks would like to do, but few are actually doing. 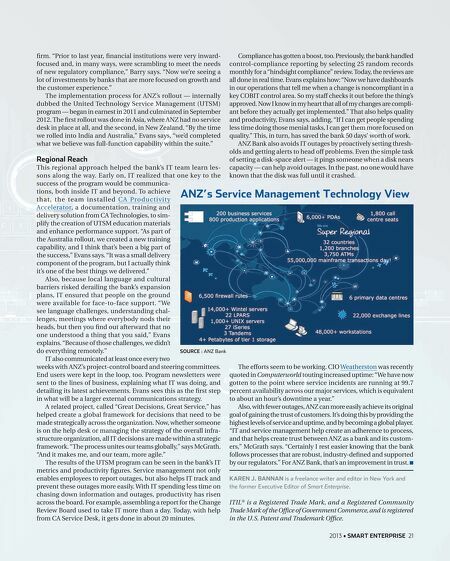 ���Right now,��� she says, ���it���s a differentiator for ANZ.��� Frank McGrath, General Manager of Technology Service Management at ANZ Bank, agrees. He says the alignment between IT and the board lets ANZ bring technology to the main board on a quarterly basis. ���Not only [CEO] Mike Smith, but also John Morschel, our chairman, understands how important technology is to banking as a whole,��� McGrath says. ���With that kind of enlightened leadership, getting alignment and approval becomes a lot easier.��� ��� K.J.B.